Belgian fast food chain Quick has created something rather... disturbing as a tie-in to the release of Star Wars Episode 1 in 3-D: a black bunned Darth Vader burger. 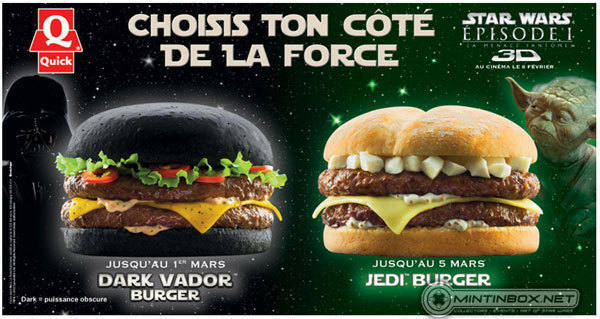 There's also a Yoda-themed Jedi burger, but I guess a green bun was considered somehow more unappetizing, so they kept in natural. There's also a burger based on Darth Maul, who apparently really loves cholesterol. 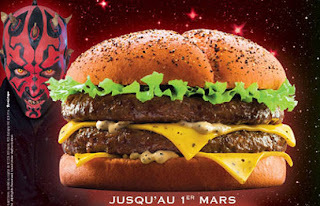 To be honest, the scariest thing about this whole deal is the thought of seeing Jar-Jar in 3-D.